Diesel Grind Cigars | Chicago's Pipe, Cigar & Tobacco Store | Iwan Ries & Co. When you think of boutique cigars with ardent followers, Diesel is towards the top, and their newest iteration, The Grind, is sure to have fans applauding. Handmade in Esteli, Nicaragua, the Grind is filled with Nicaraguan ligero and viso as well as Honduran seco all bound with a deep and flavorful Habano Honduran binder. Wrapped in a an extremely dark brown Habano Ecuadorian Oscuro sungrown wrapper, there is definitely some power behind this cigar. The full-bodied flavor of this cigar is worthy of the Diesel name. 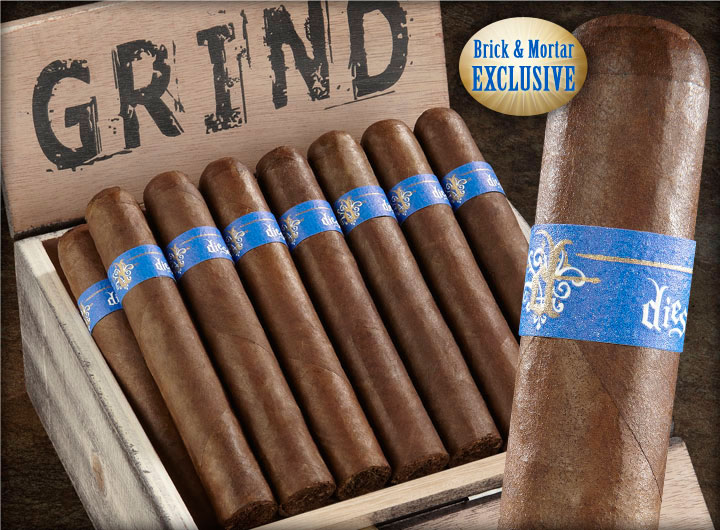 Not traditionally banded, Diesel’s Grind has a blue band surrounding the foot of the cigar. You can smoke this out of the box, but we found a little age on this cigar goes a very long way. An unaged Grind is strong and powerful, and makes you aware of its full-bodied nature from first light. With a little time in the humidor, the Grind transforms into a still full-bodied smoke, but with a smoothness that is simply put, amazing. When you first snip this cigar, you will be amazed at the ease of the draw. One thing we noticed is this caused us to smoke it entirely too fast, and be wanting another one right away.